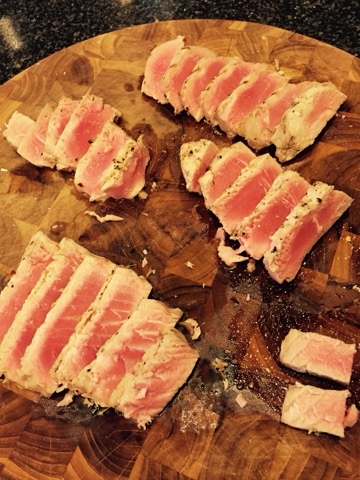 I have a few favorite methods of seasoning tuna for grilling. Several come from my beloved chef Pierre Franey's classic book Cuisine Rapide. One version uses grated ginger, paprika, cumin and lemon juice. 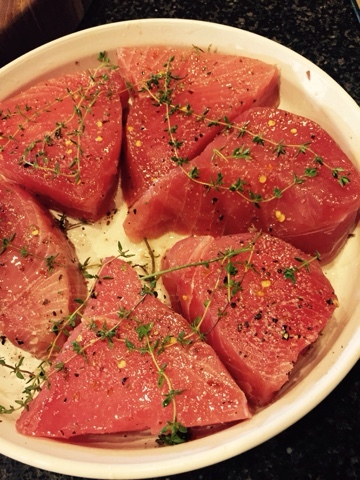 Another with thyme, garlic, lemon juice and rind is drizzled with melted butter and the marinade. All go well with a simple tomato and herb salad. However, my favorite is the simplest of all, presented here. 1. 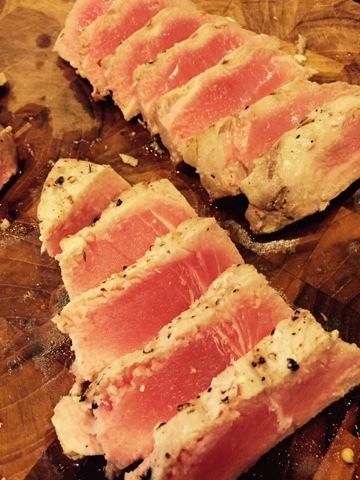 Sprinkle both sides of tuna with salt, pepper and pepper flakes. Drizzle olive oil over steaks. 2. Press thyme sprigs onto steaks. Cover with plastic wrap and let sit at room temp for 15-20 minutes. 3. Grill over high heat for 2 minutes per side, leaving thyme sprigs on the steaks. 4. Slice thinly and serve wth tomato salad or a vinaigrette for dipping. My grandparents owned a deli on Long Island in the late 1940's or early 50's I think. Grandma's potato salad was a classic and loved by customers and our family alike. The two keys to that recipe were sliced potatoes, I rarely see that anymore, and a healthy dose of celery salt. So I grew up loving that taste. This classic slaw draws on the celery theme, using both celery and celery seed. I find it important to slice the cabbages by hand, using a large chef's knife. This results in slightly larger slices of cabbage than in most slaws, creating a little more firmness and crunch. Also, the use of mayo and sour cream is a great combination, here and in chicken and potato salads. 1. Chop the celery, pepper and apple in a food processor to create a finely chopped mix. 3. Add the mayo and sour cream to the small bowl and refrigerate for 1 hour. 4. Cut the green cabbage into 1/8's then slice thinly by hand. However, the cabbage shreds should be larger than you normally see. Cut half the purple cabbage in the same manner. 5. 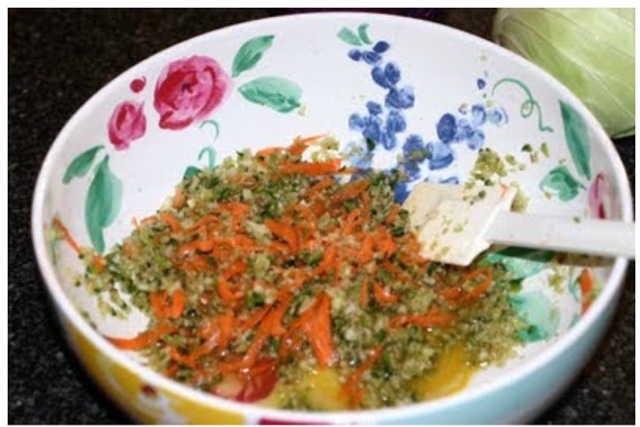 Dress the cabbages and carrot with two-thirds of the dressing. And more to your taste. As with nearly all slaws, it's better after a few hours or the next day. The vegetable purée - a key step that makes this slaw unique. 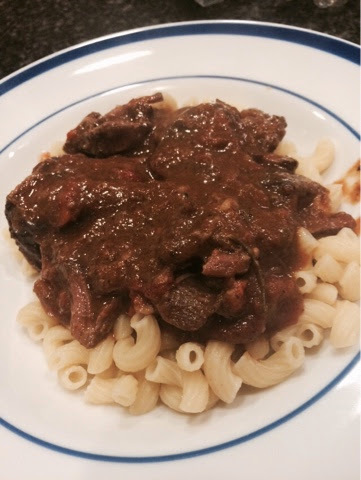 This is one of the best dishes I've made in the past year or two, possibly the very best in terms of flavor. I've served it over small pasta shapes, but it is likely best over polenta, either loose or grilled in cakes. It is very rich, so stretches to more servings than one would expect. 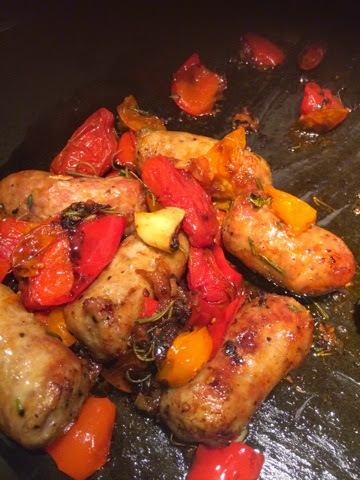 What makes this recipe so good? 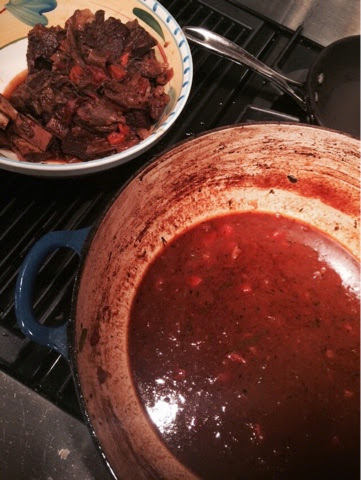 Anything with short ribs is pretty darn good. This recipe creates several distinct rich flavors - meat, vegetable, wine, herb - which all present themselves in the final dish. Cooking tip: Scrape down the sides of your Dutch oven or roasting pan during and at the end of cooking. The browned coating on the edges is super concentrated flavor that can be returned to the cooking liquid. Remove ribs, blend veg and sauce with a stick blender. Season with salt and pepper. Separate rib meat from bones and shred. Return to sauce. This is a favorite 3 ingredient dish. Just add herbs - any mix will do. 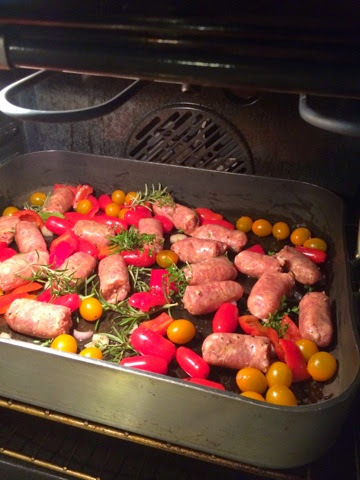 Add 2 lbs Italian sausage, 2 or 3 red and yellow peppers cut into 1-2 inch pieces and 3 or 4 containers of cherry tomatoes to a large roasting pan. Liberally douse with olive oil, kosher salt and fresh cracked pepper. Toss in 2 sprigs each of thyme and rosemary along with 1 bay leaf and 3 large garlic cloves. Roast this mess at 375 for about 45 minutes. If you remember, stir the ingredients around once or twice while cooking. 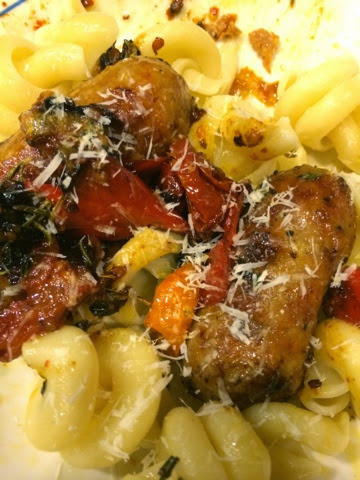 You'll end up with a sweet-savory mix that is great on pasta. Great technique on the salmon from this Food52 pairing (www.food52.com). Scraping moisture from fish skin with the blade of a chef's knife is a technique Thomas Keller mentions in The French Laundry Cookbook. Along with using high heat, this is a foolproof way to cook meaty fishes. The. 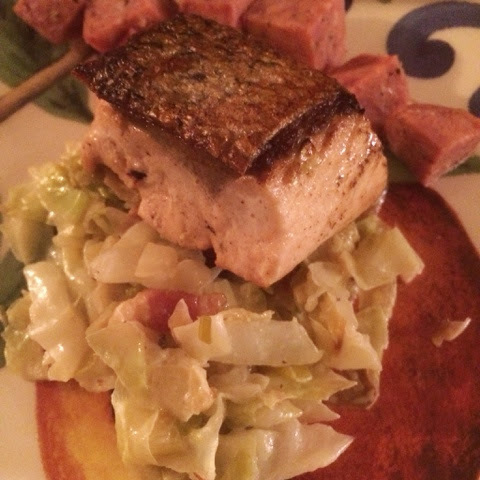 cabbage dish is one that even cabbage-averse eaters will enjoy. Technique is again a key to make this dish work. Add the cabbage to the pan of bacon and leek in three successive batches to have a blend of soft, medium and slightly crispy textures. (C) 2018, phineasJWP. Picture Window theme. Powered by Blogger.